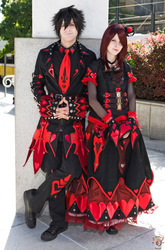 "Synchro-Hearts" is the name for Ex-Shadow and Malindachan as a Cosplay couple. They are members of a larger group, "We *Heart* Card Games," but this is their personal alias for reference in cosplay and anime convention going. Kyle and Malinda Mathis are married and have been cosplaying since 2004, and it became their favorite hobby in 2007 after they started attending conventions together. They have continued to take on new challenges with each project, continuing to delve into the arts of costume construction, wig styling, prop making, and mascot work. Malindachan especially loves wig styling and cosplaying from the YU-GI-OH! franchise, but she has also cosplayed from a large variety of other series' and games. When Malinda first got into cosplay 11 years ago, she never expected it would have such an impact on her lifestyle. Always a crafty individual, she found cosplay to be the perfect outlet for her urge to make geeky things that looked cool. She especially loves styling wigs and giving back to the cosplay community through her tutorials. Over the years Kyle and Malinda have won multiple awards for their cosplay craftsmanship and performances and have been published in Cosmode, Otacool2, CosplayGen, and Cosplay in America. Recently Kyle placed 2nd in the North American Otaku House Cosplay Idol contest, and Malinda was featured in Shonen Jump for a combination of her Yugioh cosplays and artwork. To Kyle and Malinda, cosplay is not only an art, but a community. They treasure the friendships that they have made through cosplaying, and continue to welcome fellow cosplayers as friends. They believe that cosplay is the right to anyone who wants to give it a try, regardless of their gender, race, or body type. They continue to support the cosplay community and promote it to all who would take interest.